I’m in Brussels attending the European edition of the Dassault Systemes 3DEXPERIENCE FORUM. The event is well attended by around 1,200 Dassault Systemes customers and members of the media and analyst community. Among the Dassault Systemes executives who spoke in the morning plenary session were President and CEO Bernard Charles and Executive VP Industry, Marketing and Corporate Communications. Bernard spent a lot of time explaining the Dassault Systemes 3DEXPERIENCE Platform and the compass used to describe it. Monica continued with the messaging of the 3DEXPERIENCE Platform. 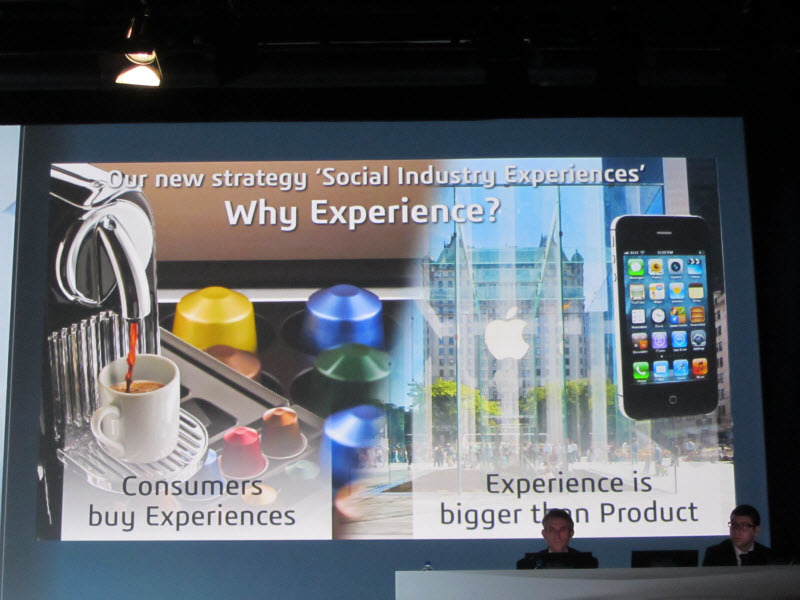 She attempted to explain something she called “Social Industry Experiences”. If you have read Dassault Systemes press releases you must know that the company has its own way explaining what they want to tell you. The long and short of what I think Monica was trying to say is that customers don’t buy products any more. They buy experiences. As an example, she reiterated something a previous speaker said about how a cup of coffee at a fast food place costs about a dollar and how Starbucks was able to charge up to four times more because of the experience that they created around the act of drinking a coffee. Apparently people enjoy the time they spend at Starbucks. I think I get Monica’s point. But personally I also think I could come up with a better example than Starbucks. Maybe something like a really nice restaurant. I stand in line at Starbucks like I do at every fast food place, pay for my coffee and walk out with it. Now, if I didn’t have to stand in line then maybe yes, I wouldn’t mind paying four times more. But standing in line and then being mechanically served a pretty normal cup of coffee by someone who would rather be doing something more interesting and financially rewarding isn’t exactly my idea of a good experience. She doesn’t make any bones about detesting the acronym called PLM. 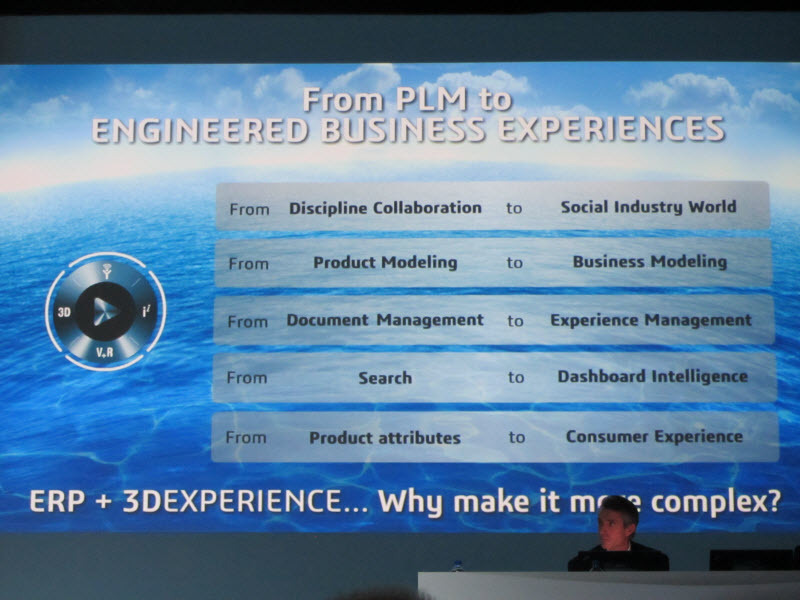 Here is how she thinks Dassault Systemes can help its customers move from PLM to something called “Engineered Business Experiences”. 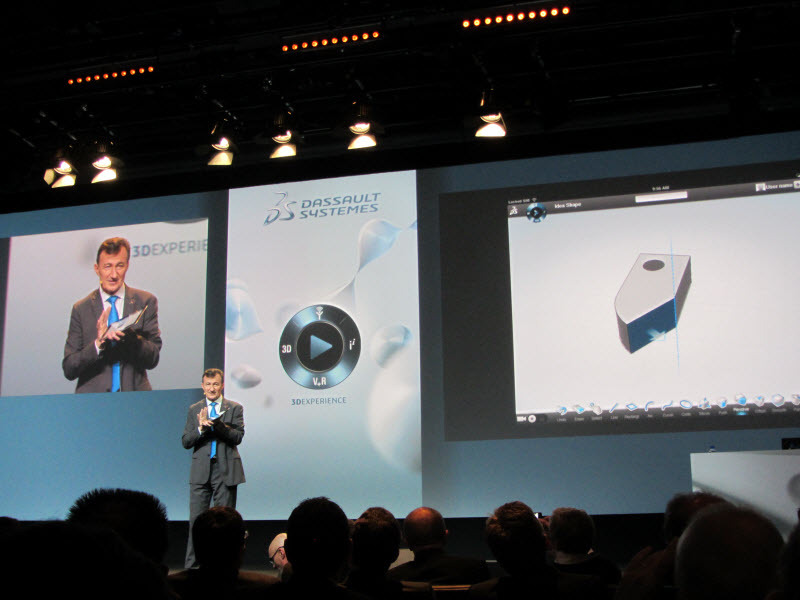 Personally I have a serious problem with that compass thing that Dassault Systemes has going on with their 3DEXPERIENCE branding. But I’m waiting to learn more about it before I offer my two cents. Maybe there really is something great to all of this and Dassault Systemes is having a hard time explaining it to people. Or folks like me are having a hard time understanding it.